When Professor of Classics Christian Wildberg walks through Princeton's campus, he sometimes notices visitors peering at the many Latin and Greek inscriptions on its buildings. There are more than 40 of them on dozens of structures -- from Nassau Hall to Frick Lab. "They were looking at Alexander Hall, where there is a very prominent inscription, and I could see from their faces that they were drawing blanks," he said. "At the same time they sensed that the inscription was a very important feature of the building." So Wildberg started translating some of the inscriptions for himself. But more than just figuring out the English translation, he realized, what he needed to do was research the history of the inscriptions to uncover their meaning. And, he decided, it would be useful to make that information available to others. He brought the idea to Paula Hulick, an academic technology specialist at the Education Technology Center, part of the Office of Information Technology. "At Princeton it is just fabulous: You have an idea, you tell it to a couple of people and all of a sudden the support you need is there. You have the resources to do it," said Wildberg. The result is "Princeton Epigraphy," a Web site that offers links to photographs of every classical inscription on campus, accompanied by a translation and an explanation of the reference. A video by Wildberg offers a brief introduction to the site. Users can look at a campus map that highlights each building with an inscription and choose which ones to look at. 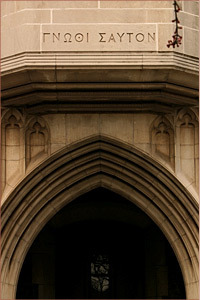 "Gnothi seauton," the inscription over the south entrance of Eno Hall, is Greek for "know thyself." Professor Christian Wildberg described the origins of the inscription: "These words were engraved above the entrance to the temple at Delphi and adopted by Socrates as his personal motto. It's so subtle that you hardly notice it as you enter Eno Hall."